When purchasing car insurance, there are many factors that can affect the coverage and cost. When trying to decide, it’s easy to get confused or be misinformed on what your insurance covers. As a result, motorists can wind up underinsured or paying more than they should. We’re going to share the top five myths for auto insurance, so we can help you and your family make an informed decision the next time you purchase or renew your policy. Washington law only requires motorists to have at a minimum a $25,000 liability policy. Many respected consumer watchdog groups and insurance industry advocates suggest that you carry a liability policy of at least $100,000 per person and $300,000 per accident. Even this amount may not be enough if you have significant personal assets. If you cause damage that exceed your liability policy limits, you could be personally liable for the difference. If you have considerable assets, you should purchase a policy with high liability limits and also consider purchasing an additional umbrella liability policy. While having enough liability insurance may protect your assets, having enough underinsured motorist coverage may be the most valuable insurance you can purchase. Underinsured motorist coverage applies in situations where another driver causes you damage, but that driver does not have enough insurance to cover the loss. Without the insurance you may be unable to collect. You should make sure you buy enough liability insurance to protect your assets in the event you cause an accident. You should also buy enough underinsured motorist coverage to insure that you will be taken care of in the event an uninsured or underinsured driver causes you harm. Make & Model: A luxury sports car is going to cost significantly more to insure than a moderately-priced sedan. Engine size: 4-cylinder cars cost less to insure than cars with bigger engines. Body type: Coupes tend to cost more than 4-door sedans. Washington law does not allow an insurance company to raise your rates unless you were at fault in causing an accident. If you get into a car accident, always file a police report and contact your insurance company. Never leave the accident scene with just a verbal agreement with the other driver. Even if there is only minor damage to the vehicles and no apparent injuries, damage and injuries can develop later. The police report serves as a record of the incident. It provides your insurance company with a basis on how to properly handle your claim. It can also ensure protection for you if there are any future legal problems that occur from the car accident. Your car insurance will only cover the fair market value of the car. To determine fair market value, you take the original cost of your car and then subtract depreciation. There are many websites, such as Kelly Blue Book, that will give you an estimation of the current fair market value of your car. If the car is totaled, many people find themselves having to continue making car payments, despite them not having the vehicle anymore. You can help prevent this situation from occurring by purchasing Guaranteed Auto Protection (GAP) coverage through your insurance company. GAP coverage will kick in after fair market value has been determined and you won’t have to make monthly car payments on your totaled car. Personal property inside a vehicle is usually not covered by standard car insurance. You would need to have either a homeowner’s policy, or supplemental personal property insurance added on to your car insurance plan. The best way to prevent personal property from being stolen is to not keep anything valuable in the car. However, if you have no other option, then make sure to lock your car doors and keep it out of plain view. Most break-ins happen because the owner of the car didn’t lock the doors. Auto accidents happen when you least expect it. Having a solid auto insurance to cover any potential damages or claims is critical to preventing a lengthy and costly legal battle. 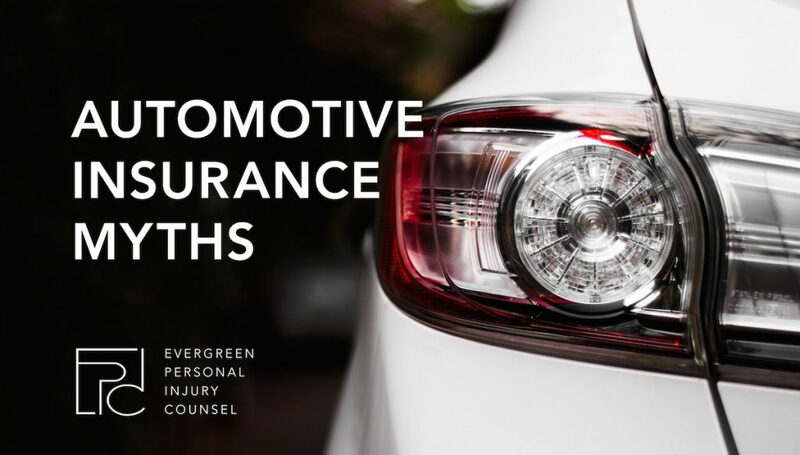 If you have any questions regarding the coverage afforded by auto insurance as it pertains to a personal injury claim, contact one of our experienced and qualified attorneys at Evergreen Personal Injury Counsel. Our attorneys would be happy to sit down with you and answer any questions you may have. What is Personal Injury Protection (PIP)?